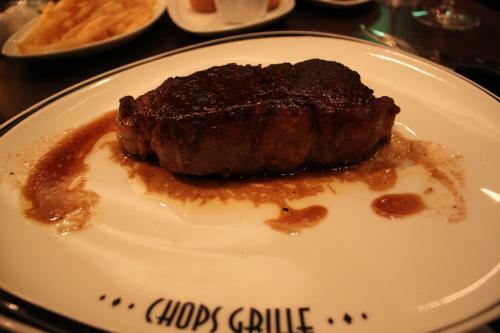 Chops Grille has become a staple of Royal Caribbean dining and it is a restaurant guests come back to time and time again because they really enjoy everything about the experience. The next time you make a reservation at Chops Grille, whether it is your first visit or you have lost count, be sure to look for these gems that are worth trying! I am pretty sure I always forget about the pretzel bread is served at Chops Grille when you are first seated but as soon as I see it, I dig right in. To be honest, it is difficult to screw up pretzel bread. It is warm, salty and related to those tasty treats you always smell at the mall. How can you go wrong? The pretzel bread is the perfect way to start a meal off at Chops Grille and the only problem is remembering not to fill up on it before you even order anything! Sure, Chops Grille has a lot of great steaks but no entree is complete without a few of Chops Grille's signature sides. Truffled french fries, roasted mushrooms, mashed potatoes, grilled jumbo asparagus and more are available. My recommendation is just order one of everything. It is the same cost to you and that way you can sample them all. You will quickly find that the sides are a meal in of itself! 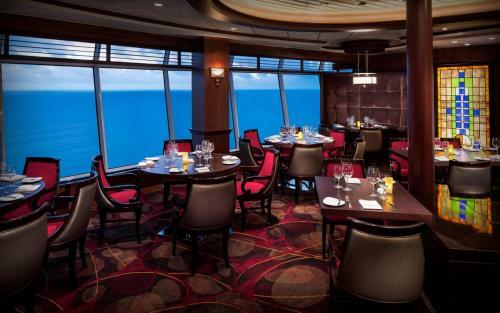 Let us take a break from the food for a moment to point out that Chops Grille across the fleet have beautiful views of the ocean. If you happen to dine in Chops Grille for lunch or have an early enough dinner to catch the sun still up, the view from Chops Grille is hard to beat. Since I often eat at Chops Grille for dinner, catching a Caribbean sunset while I enjoy some pretzel bread, or some of those delicious sides is a great way to start my evening! This part of our countdown is a salute to all of Chops Grille's desserts, but mostly the red velvet cake. Everyone has personal tastes about what they like but I dare you not to love this cake. And the huckleberry cheesecake. And the cookies. But mostly the red velvet cake. The thing about dessert is usually most guests are stuffed with the amazing appetizers, entrees and sides that dessert just seems impossible. Until you look at the menu. Make a note or tie a string around your finger to lay off a few bites elsewhere to save room for dessert because the red velvet cake is worth it! Royal Caribbean introduced dry aged steaks in early 2014 and the steak experience has never been the same. Dry aged steaks are very popular at the premier land steakhouses, so Royal Caribbean's decision to bring dry aged steaks to sea is a big deal. For those unaware, a dry aged steak is when steaks are stored in a climate-controlled room for nearly four weeks to achieve the pinnacle of flavor, tenderness and aroma. It really enhances the flavor of the meat in a way conventional steaks cannot match. Yes, there is an extra cost to trying the dry aged steaks, but it really does make a difference and if you consider yourself a steak fan, going with the dry aged steak is like a trip to the Vitality Spa for your stomach!